A Marathi version of Pradhan Committee report was tabled in the state assembly on December 2009 after the opposition demanded to see it, along with this Action to Be Taken report. On December 30, 2008, the Maharashtra government appointed a two-member High-Level Enquiry Committee to probe the security forces’ response to the 26/11 Mumbai terror attacks. The committee comprised former home secretary Ram Pradhan and former IPS officer Vappala Balachandran. A Marathi version of it was tabled in the state assembly on December 2009 after the opposition demanded to see it, along with an Action to Be Taken report. The Action to Be Taken report is available only in Marathi. The Commonwealth Human Rights Initiative has obtained the report through an RTI and placed it in the public domain. The NGO has also release an unofficial English translation of the Action to Be Taken report, with portions highlighted to help readers. Full text of the unofficial English translation is below. You can read the Marathi original here. 1. This committee has attempted to analyze how far the existing procedures, mechanisms and administrative culture can be blamed for the lapses. The Committee has given special attention to finding out the shortcomings in the overall process. A High Level Committee will consider and take a decision on the recommendations mentioned by this committee seriously. 2. If there was a thorough evaluation of the intelligence report and proper analysis, then the possibility to ward off the terror attacks in Mumbai would have been possible. The existing machinery/mechanism is inadequate to assess the overall situation. There is no conclusion that the Mumbai Police has not taken the available intelligence reports seriously, despite the lack of specific alerts from central intelligence agencies. The Jt Police Commissioner (law and order) on 9.8.2008 issued an alert regarding specific attacks on targets in south Mumbai like Taj, Oberoi hotels and World Trade Centre. The Deputy Commissioner of Police, Zone 1 and their staff members took this warning very seriously. He himself visited all the places on 11.08.2008 and on 12.08.2008, issued written instructions on security measures. Senior Police Inspector of Marine Drive Police Station, gave written instructions to the security manager Oberoi in relation to the security measures of the Oberoi Hotel and various other hotels. He also provided written instructions in relation to security measures to representatives of malls and multiplexes within his jurisdiction. After meeting the alert center on 24.09.2008 on the specific targets like Taj Mahal Palace Hotel, etc., the Deputy Commissioner of Police, on September 29, 2008, had another meeting with security officials in the Taj Hotel. General Manager, Shri Karam Veer Kang was also present. Police Deputy Commissioner, Circle-1, again personally visited the Taj Hotel on 30.09.2008 to provide information to the security officials. A meeting in relation to the 26/11 attacks was held with the Central Intelligence Department and SPG and Trident Hotel. In it Mr. Vinay Kargaonkar, Deputy Commissioner of Police (Security) was also involved. It appears that according to the Central Intelligence agencies the terror attacks were not predicted. After 26/11, the Home Department has started weekly meetings of Home secretaries of the Government of India under the chairmanship of Minister (Home), along with Additional Chief Secretary (Home), Director General of Police, Police Commissioner and Commissioner (Intelligence). This group is analyzing thoroughly, the preventive measures taken and future measures to be taken. 3. In this regard, the Committee is of the view that the management of Taj and Oberoi hotels did not take seriously the security measures and advice provided by the Police Deputy Commissioner, Circle1, and did not implement the necessary arrangements. Considering this warning, the committee has taken note of the fact that Taj or other hotels did not request additional police security for their hotels. Security audits of Taj and Trident have been done and all the necessary measures have been taken to increase safety. This includes monitoring the visitor and their belongings, monitoring the route of the rooms and other measures. Measures will be taken to implement planned implementation and supervision programs for private organizations and establishments. 4. In the situation, the Committee has found that intelligence reports are mechanically forwarded to operational units by the DGPs office, or ATS or Home Dept. The Committee has found that there is no adequate procedure in place for processing these intel reports. With this in mind, the Committee is recommending that the Principal Secretary ((Home) (law and order) should be nominated as the Nodal Officer for receiving such reports and taking action on them. Full information about confidential and actionable issues, should be given to the Additional Chief Secretary (Home). And he ultimately take responsibility of all working of the department as he also has legal obligations as per the Bombay Police Act, 1951. The Additional Chief Secretary (Home) will also have the responsibility to provide complete information about this matter to the Home Minister and the Chief Secretary. There must be a nodal point in the Police HQ to deal with all matter related to the security of the state as a whole. The Committee recommends that the Commissioner, State Intelll Department should be the nodal point since he is in charge of all information. For Mumbai city we recommend that a small group of senior officials be formed to convey actionable on receipt of intelligence to the Commissioner, state intelligence department, or central intelligence department after receiving the sensitive/confidential information. Under the leadership of the Jt Police Commissioner (Law and Order), this group should include Additional Commissioner (anti-terror squad) Additional Commissioner (Special Branch), Additional Commissioner (Protection) and Additional Commissioner (Crime). According to the requirement, this department should also invite the concerned Additional Deputy Commissioners of Police. This group should also decide whether an issued alert needs to be removed or considered low priority. For the rest of the State, in cities where Commissionerates exist, the Director General of Police should set up small groups to liaise about potential terrorist attacks. After 26/11, the Home Department has completely changed the way in which action is being taken on confidential sensitive information. In the Ministry, Principal Secretary, Home Department (Law and Order) received all the confidential reports and has been referred as nodal officer for action. Commissioner, Intelligence is acting as the nodal officer between Centre and. The intelligence received by Government of India is being sent directly to the Director General or the Chief Secretary. Weekly meetings will be held for the scrutiny of departmental analysis and assessments. Instructions will be given for setting up small working groups in the offices and districts. In Mumbai, the Police Commissioner (law and order) will lead the group and the police commissioner (Anti-Terror Squad), Additional Police Commissioner (Special Branch), Additional Commissioner of Police (Protection) and Additional Commissioner of Police (Crime) will be involved in this group. The concerned Regional Additional Police Commissioner will be convened as per requirement. The group will be responsible for periodically assessing security risks and arrangements. There is a need to make changes to the current Mumbai Police Service’s Quick Response Team (QRT) regime, so that the team is able to reach any corner of the city within the shortest possible time. It has also been noticed from the Committee that, although these teams are named as assault and mobile, their current nature is limited to the police station. The use of such a squad can handle a local law and order situation like a gang war. However handling a terror attack like 26/11 would be out of capacity of the QRT. The Committee also examined the current working process of handling the bomb blasts. According to this procedure, the Police Commissioner (Law and Order) will be heading the Crisis Management Command and in charge of all the control rooms. It is also prescribed in this method that along with the Jt Police Commissioner (Crime), he will be in touch with the Jt Police Commissioner (AntiTerror Squad). These instructions were not followed on 26/11. Instead, the Police Commissioner asked the Jt Police Commissioner (Crime) to handle the situation as in charge of the control room. If the protocol had been followed, the Police Commissioner (Law and Order) would have been able to decide on deployment of police forces at different places. However, the Committee has taken note of the performance of Jt Commissioner (Crime) Mr. Rakesh Maria in the control room in handling this very serious situation. All the officers / staff in the control room have performed the work of wireless system, driver and keeping records. The Committee has been subscribing to the opinion that it is not appropriate to neglect the carefully established SOPs in the the time of such disaster. If such senior officials like the Police Commissioner or the Director General of Police decide to not give proper attention to the standard operating system, there is little reason to keep such practices. We have come to understand that the Police Commissioner has not even informed the counter-terrorism squad to report any such incident. After the series of attacks on 26/11, it was necessary to have a detailed discussion and detailed analysis of the incident within the department. This would have caused a strong sense of association and the corrections that needed to follow. Governments will set up a Quick Response Team for other cities like Mumbai, which could be potential targets. These teams will have sophisticated weapons and infrastructure. Commandos will be part of these QRTs. In order to handle the question of law and order, anti-terror units will be used as Police Units. According to the SOP, the Police Commissioner (Law and Order) will be the Chief of Disaster Management and he will supervise the work assigned to the departmental control room, the main control room, the police station’s staff, the district police deputy commissioner and the departmental additional police commissioner. According to the standard working procedure, the Deputy Commissioner (operations) is required to work as a control room officer. On 26/11, and thereafter the Deputy Commissioner of Police (Operations) is in charge of the control room. However that the situation was an emergency was known soon. What was required was senior and experienced officers to handle the situation. There was delay, however Rakesh Maria stepped in to provide the necessary instructions and advice. It would be incorrect to say that the standardized operating system was not followed. But at the same time it is also true that it was necessary to increase the strength of the control room and reassign officers. After the incident as per the SOP it is not necessary to discuss reports from the officials. The time limits and detailed procedures as well as the level of authority is not included in the SOP. This lacunae will be addressed by the government. 6. While the media was reporting there was no briefing either by the police or by mantralaya, it was only the control room that had detailed information. The Commissioner of Police as head of Crisis Management himself could have held regular briefing or assigned a spokesperson to do the job. Disaster Management Centers opened with the help of Chief Secretaries, officials in their ministry. From there on the night of 26/11, the media was regularly informed about the current incidents. Meetings were held and information was then passed on to the media from mantralaya and the hospitals. 7. Government of India had notified the Indian Navy as the designated authority responsible for overall maritime security with both coastal and offshore security under its control. However the responsibility of the State Marine Police is not clear. The Committee feels that it would be impossible for the Maharashtra police including Mumbai police to undertake the responsibility of coastal security within their jurisdiction. The Committee is of opinion that the present arrangements are cosmetic. This observation is made on the basis of assessments made by officers in the field. This issue should be resolved by the administration from the point of view of long term practical implementation. The Ministry of Defense has appointed nodal officers and coast guards for complete maritime safety. However, the official nature of the field and the exact nature of their responsibilities have not been determined. Also, it is not always possible to differentiate between coastal region security and maritime security. In order to strengthen the police system in the coastal area and to monitor the movement of ships in the coastal route of Maharashtra, the Home Department has taken specific steps by interacting with the Fisheries department. After 26.11.2008, the Defense Ministry has taken the responsibility of protecting the marine and its coastal security system. The State government has also decided to use the recent impetus. 400 police jawans were trained in batches of 20. 24 police chowkis have been set up and 7 extra chowkis be set up as per the requirement. Two boats have also been received from the Goa Shipyard Company for monitoring the coast. 8. The order of former Dy CM in getting approval for all purchases above 25L has created several barriers in the modernization of the police- (Govt. No. No. PK012000 / PC / CR-15 / Police-IV, dated May 29, 2000). It is necessary to reconsider the increase in this limit and entrust this responsibility to the Committee of senior officers. Purchases for the police force falls under two categories. The first type of purchase is done by the DDO of the Ordinance Factory under the direction of the Director General, Supply and Dispatch. Sanction for such purchase is given by the Police Commissioner/Director General of Police. However, purchases in the second category are done through a tender process. Purchases above Rs 25 lakhs for police modernization require the approval of the government. 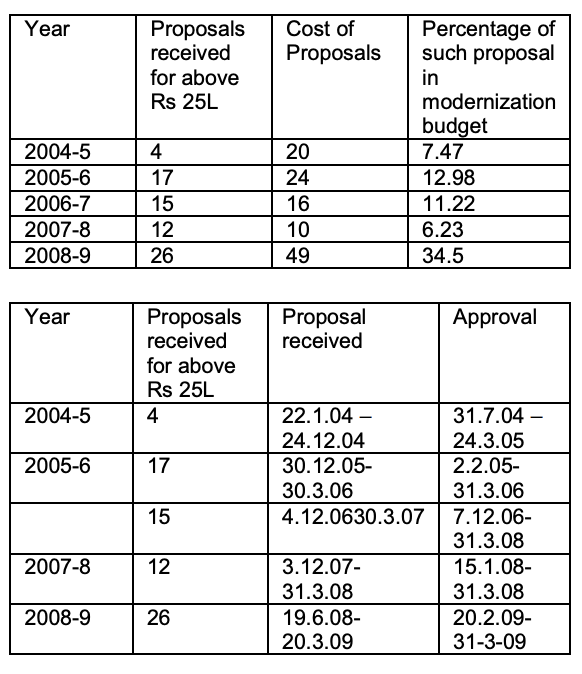 The following table shows that all the proposals received are approved before the financial year ends. It is clear that due to this procedure, no problem has been created in the process of modernization. 9. It is necessary to simplify the purchasing process and to assign it to the lower levels. Instead of delaying documentation, we recommend that an Empowered Committee be formed to address the hurdles and clear the pending proposals. The Home Department has earlier issued order # 040 9/522 / CR 270 / POL 4 dated 20 May 200 9 for the purpose of redressing the purchasing policy during the year. Also, an Empowered Committee has been set up under the control of the Director General of Police for the purchase of all kinds of equipment. This Committee comprises representatives of the finance department, home department, udyog department and the udyog Commissioner. In this, there is a provision a single purchase policy has been designed for the whole state. 10. Availability of weapons and ammunition to the Maharashtra Police is a problem. According to Police Commissioner A N Roy, firing practice is to be done every four days. It has been mentioned that since September 2007, due to the shortage of ammunition, the team has not been able to do so. Due to shortage of funds Maharashtra police faces an acute shortage of weapons and ammunition. However, the Home Department informed the Committee on 6.4.2009 that after the proposed proposal and the subsequent proposal submitted on date 7.6.2008 have been cleared. The committee feels that it is necessary to solve this problem promptly rather than increase the paperwork on it. 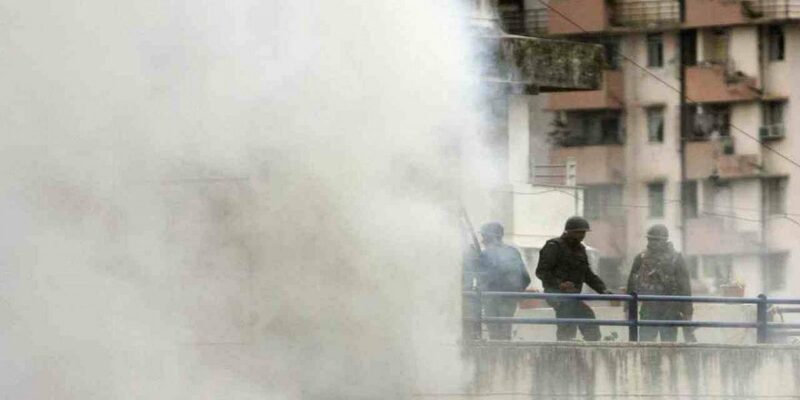 The DGP has informed the Committee that every year it is mandatory for every police officer to fire 40 rounds. However in the last 5 years this ammunition has not been made available. Sufficient ammunition must be provided in terrorist and naxal infested areas where commandos have been deployed. The DGP has informed this Committee that due to shortage of ammunition, police personnel were not able to practice firing and this is negatively affecting their combat performance. For eg, the last stock of AK 47 bullet got over in December 2006. Thereafter no supplies have been received. A quick decision/solution needs to be taken on this issue. The Committee recommends that, the implementation of decisions also removes monitoring obstacles from the political level. From Annexure 1, it will be seen that most of the items are subject to this policy and these items are being purchased in advance. All these things are being purchased according to DGS And D’s contract and there is no requirement for government sanction in this process. The statistics given by Additional Chief Secretary, Home has been received from the office of the Director General of Police. From this it is clear that the DG office has been receiving the required ammunition each year. For AK 47s in the year 2006-07, 165,810 rounds and for 2008-09 38,195 bullets have been provided. Therefore to say that there was no ammunition received after the 45,000 bullets received in 2005 is manifestly incorrect. The Government will now decide the Arms Policy and in it the police will specify the types of training required for different ranks and levels. It will also include the training required for special forces and the ammunition needed for practice. In addition, there will be instructions for the need and maintenance of firing areas and arsenal. Government has constituted a Cabinet SubCommittee under the supervision of Deputy Chief Minister for monitoring the procurement of all material. 11. Any decision taken by the Government in the public interest, must be followed by an explanation no matter how high ranking the official who takes that decision. The Committee felt that due to the dual supervision of the anti-terror squad its functioning was not smooth. The Committee is of the opinion that teams should be set up for meeting the needs of the city as well as needs off city limits. These teams should be placed within the Police HQ and at the disposal of the Police Commissioner. The command and control structure of those teams will be done by the Director General of Police. It is important for them to always keep them in constant control of their skills, training them and keeping them ready to face any situations. It is also important to not place these special teams under different officers nor position them at varied places. This is an important lesson from the 26/11 attacks. The Government fully agree with the opinion that the government should not make any changes in their decisions in the interest of governance. The post of Director General of Police (Special Action) has been created recently and the officers of the rank of Director General of Police will be given the charge of special operations and the responsibility of the anti-terror Squad. So there will be no question of dual control. In addition to this, a Force 1 unit has been established, equipped with state-of-the-art equipment. This Unit will deal with issues of terrorism along the lines of the NSG. The government has given specific instructions on the structure and the chain of command of this group. This unit will not be allowed to split into small units. 12. Investigation/inquiry of all terror related incident within and outside Mumbai presently rests with anti-terror squad. Govt should reconsider this decision and accordingly issue special instructions. Such a formal decision will be taken at the government level. 13. Taking the 26/11 experience into account the Committee recommends that private sector establishments especially hotels with a large foreign clientele should put in place adequate security procedures in place in consultation with the police. The Addl. Commissioner of Police (Protection) should be designated as nodal officer for police-private sector security partnership and periodic participation from divisional police units As mentioned earlier, all the specified sensitive and intrinsic installments have been audited and the necessary security arrangements are being implemented. Additional Chief Secretary (Home) and Director General of Police and Police Commissioner will monitor and regularly review the same. 14. Mumbai police, presently has no access to the CCTV cameras installed in private establishments. When required information/footage from these cameras maybe requisitioned following legal procedure. In this context, the Committee notes that NYPD and other police forces have access to the footage. Further private security personnel are not trained in handling security devices and need training. This is a useful lesson for Mumbai in monitoring cctv cameras in all public places malls, railway stations etc as the onus of maintaining law and order rests with the police. The experience would also indicate closer coordination between the city police and mobile service providers. However Mumbai police should also focus on upgrading their own monitoring and tracking capabilities regarding cellular communications. Training of private security personnel to handle compulsory security measures, as mentioned above, will be followed by advice from the Government. Also, such code will be established with private organizations for disaster management. The legal procedures will be set in place to access CCTV footage from private establishments. 15. There is an urgent need to fill all vacancies of officer and constable levels in Mumbai police. Also present training facilities are not adequate to train the increased number of officers and thus Government should consider appointing retired police to train the new recruits. A robust action plan has been taken up for the entire state including Mumbai. The vacant posts of the Police Deputy Superintendent / Assistant Police Commissioner to the Director General will be filled up by July and vacant posts of the Police Sub-Inspectors will be made by the end of October. 16. Government should consider establishing a State Industrial Security Force on the lines of the CISF to provide security to the private sector. Untrained private security is presently providing security to private establishment. The model has been successful in Gujarat. The proposed Maharashtra SISF should be trained by police training schools utilizing retired police trainers. In Gujarat, the GISF is formed as a society with Home Sec as Chairman and a senior police officer as CEO. They have a strength of 2500 and deployed in various locations like Vadodara Ahmedabad. Decision to set up a SISF on lines of the CISF has been taken. The said force will be established by end of October. 17. State provides security to too many private individuals. This is draining the states coffers. If any danger is perceived to any individual’s life, the person applies for security and the state is bound to provide the same without charging any monies. Sometimes the person maybe charged for such security. 18. During our visits and meetings, the Committee found that working conditions of the control room are unsatisfactory. The control room is the focal point for any crisis management and accordingly a fire and blast proof structure be constructed in the same office premise which is a 150 year old building. Priority should be given to developing the control room into a state of the art structure. The control room is highly sophisticated and well equipped. Decision to further strengthen it to make it fire and blast proof will be taken within this year. 19. Recommendations to transform the functioning of the police were given almost 3 decades ago by the National Police Commission and thereafter reconfirmed by the Supreme court. These recommendations need to be implemented on an urgent basis. 3. Tenure of Other officers: Fixed tenure of two years provided. 20. The Mumbai Police faced five terror instances in the short span of time and it is definitely a matter of pride that it worked fast and promptly. The courage and strength that the young officers have shown to lead the police force to face terrorism is appreciated. Despite the challenges and shortcomings the Mumbai police faced the attacks with unmatched courage strength and patience. The Committee has appreciated the response of the Mumbai police. The Government will inform all the officers about the Committees praise and appreciation. 21. The Committee is of the view that in nature of the emergency required the Police Commissioner to take command of the Control Room Center himself. That would have ensured better utilization of forces and prevented duplication of efforts by different units. No clear mention has been made regarding the completion of the attempts made by various police units. Written documents of Police Commissioner have not been taken on record. Where the regional Control Room was set up, The Commissioner stationed himself there and took charge of the situation himself and was monitoring the events personally. 22. In the present situation it would be shocking if senior-most officials in the ministry do not get information about sensitive confidential information. Under the Mumbai Police Act, 1951, the overall control of the police force rests with the Home Department. This is clearly stated in section 4 of the Mumbai Police Act, 1951. However this method of operation is not desirable. The Additional Secretary, Home or Secretary, Law and Order, (which are generally the senior officers of the IPS), should not just focus on secretarial work relating to the terror attacks. Instead they should remain active not only in the city of Mumbai, but also in other sensitive urban / rural areas and constantly monitor the situation. We disagree with the view taken by this Committee. All confidential sensitive information available with the Commissioner is transmitted weekly to the Addl. Principal Secretary and the DGP and the officers are also briefed weekly about all such information. Necessary written information/instructions are accordingly passed on to all offices including regional and divisional officers. As per section 6 and 24 of the Bombay Police Act, it is mandatory to seek information from the Police HQ about crime and security of the State. After 26/11 a weekly meeting regarding confidential information is being conducted with the DGP and other officers directly under him under the chairmanship of the Home Minister. 25. However, we found that the Police Commissioner, Mumbai did not take adequate initiative in handling the attack. During the whole operation he stayed in the same place near the Trident hotel. Due to lack of coordination and visual control in the office of the Commissioner, there was a feeling that police treated this matter in an incompetent manner. Many senior officials told us that the Police Commissioner has not guided or inquired about the current proceedings. We have come to the conclusion that Mr. Hassan Gafoor, Police Commissioner, lacked insight and direct leadership. We disagree with this view as according to para 4 and para 5.1 it is clearly stated that Mumbai police has performed its duties and tasks efficiently. In order to deal with terrorist activities, many tools and processes had been set up in the past. But, we have found that they have either become weak or not relevant with time. The dangers we face today are of very serious nature. And from the nature of terror acts it is also clear that now we need more efficient and modern weapons that can match with those used by terror groups. We have now placed significant importance to procurement of modern weapons toward police modernisation. Establishment of Force 1 as well as the position of DG (Special Operations) we are making in-principle changes to the functioning of the police. Viewing the seriousness of the attacks the working of departments is also being revised under the guidance of the Home Ministry. 27. It is necessary to assess the capability of the Mumbai police. There are 3 Police Commissioners – Mumbai, Thane and Navi Mumbai. The coordination between these officers was not adequate and it may be necessary to review the limits of their administrative control. A Committee has been set up to undertake this task. The DGP does not have any administrative limit in the whole state. In the Bombay Police Act, it has been mentioned that there are administrative boundaries, only for day-to-day operations (Kalam 23). Section 3 of the Act clearly mentions that the entire police force in Maharashtra is one Police force. Section 6 and 7 (k) and (g) mention that the Police Commissioner is working under the orders and control of the DGP. The DGP is not just senior than the Police Commissioner but he is chief of the entire police force and is responsible for the safety and security of the entire state.